The promotion of active transport (a type of sustainable transportation) such as walking is a form of response against environmental pollution engendering from transport sector. Pedestrian level of service (PLOS) is a measurement tool to evaluate the degree of pedestrian accommodation on roadway to provide a comfortable and safe walking environment. The roadway characteristics-based model to measure PLOS has been widely applied since this approach is conceived as being transferable to different contexts. We present a comprehensive framework to measure the influence of pedestrian facilities on perceived PLOS qualitatively and quantitatively. 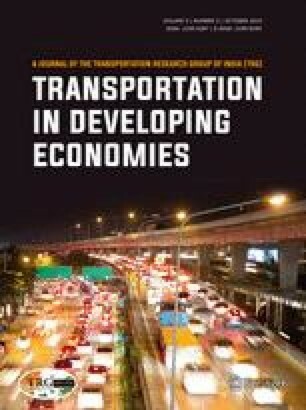 We modeled triangular relationships among pedestrian facilities, perceived roadway conditions (accessibility, safety, comfort, and attractiveness), and perceived PLOS to identify pedestrian facilities, related to footpath, carriageway, and transit, influencing perceived PLOS. We developed these models for a case study of Chittagong Metropolitan Area in Bangladesh. Poor condition of pedestrian facilities in the region resulted in PLOS B as the highest tier of perceived PLOS. 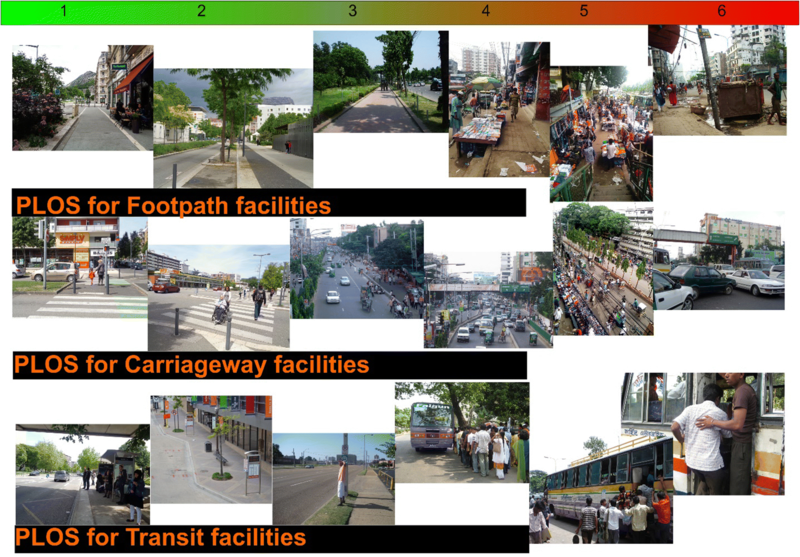 Findings of this study showed that accessibility and attractiveness influenced the perceived PLOS for footpath, carriageway, and transit, whereas safety is an important roadway condition for carriageway and transit facilities. We further measured the influence of 22 selected parameters of pedestrian facilities on roadway conditions and perceived PLOS. We concluded that achieving a better perceived PLOS is dependent on the availability, maintenance, and planning of different pedestrian facilities, as improper placement and poor condition of such facilities increased the probability that a lower level PLOS will be perceived. We are pleased to express our gratitude to the Department of Urban and Regional Planning (DURP) of Chittagong University of Engineering and Technology (CUET) for providing logistic support to carry out this study. We also thank the anonymous reviewers for their careful reading of our manuscript and insightful comments and suggestions. All the following information was collected on a 1 to 10 scale where 1 denotes inferior condition and 10 denotes superior condition. Mark the existing connectivity of the footpath with the adjacent land use. Mark the continuity of the footpath throughout your journey. Mark the safety from crime on footpath. Mark the safety from traffic on footpath. Mark the usability of the available facilities on footpath. Mark your convenience level on using this footpath in different weather condition. Mark the attractiveness of the footpath. Mark the attractiveness adjacent to the footpath. Mark the crosswalk facilities available on the carriageway. Mark the adequacy of traffic control measures to prioritize the pedestrian on roadway. Mark the safety from crime on carriageway. Mark the safety from traffic on carriageway. Mark the usability of the available facilities on carriageway. Mark your convenience level on using the carriageway in different weather condition. Mark the attractiveness of the carriageway for you as pedestrian. Mark the attractiveness adjacent to the carriageway for you as pedestrian. Mark the sidewalk connection with the transit stoppage. Mark the adjacent facilities available around the transit stoppage. Mark the safety from crime on access/egress point of transit. Mark the safety from traffic on access/egress point of transit. Mark the usability of the available facilities on transit. Mark your convenience level of using the access/egress point of transit in different weather condition. Mark the attractiveness of the access/egress point of transit. Mark the attractiveness of the adjacent area of access/egress point of transit. Card used to collect information on perceived PLOS of footpath, carriageway, and transit.